Umbra creates useful housewares with a playful spin. The latest collection called Umbra Shift expands on that idea with a specialty line of products whipped up by eight emerging designers. The Shift collection includes whimsical items that you would expect from Umbra like a desk lamp that doubles as a pencil cup and a small spoon-shaped clock you can hang on a wall. 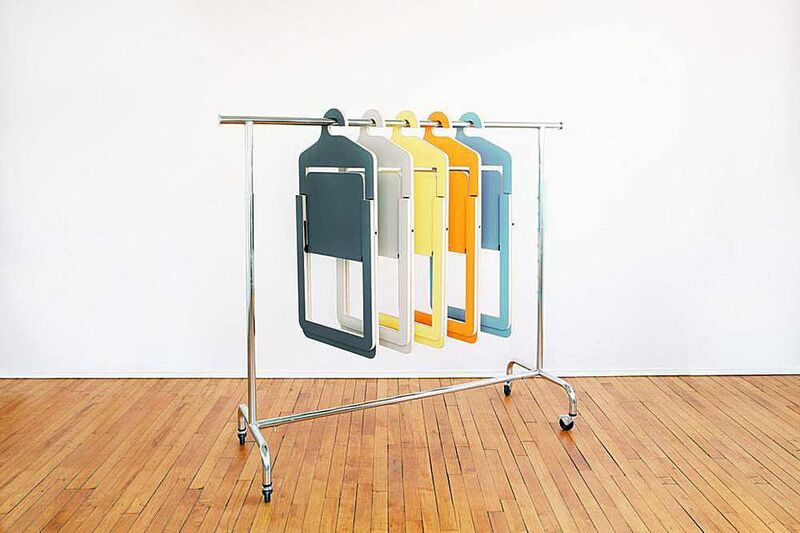 But one item solves a common small space problem — It’s The Hanger Chair by French Canadian designer Philippe Malouin. What makes this chair so ingenious? When the seat is not needed, you can use it as a clothes hanger. To see more items from the Umbra Shift Collection keep reading. Shown here are three items from the Umbra Shift collection. On the wall is the Spoon Clock by Albert Lee. On the desk is the Brick Lamp by Philippe Malouin. The Hanger Chair is also by Philippe Malouin. Shown above is the Cup Lamp from the Umbra Shift collection designed by Paul Loebach. We will let you know when Umbra Shift hits store shelves. Have a small space solution you would like to share? Leave a comment.